Spread over a 1300 acre sprawling campus and peopled with elegant old buildings is the Osmania University in Hyderabad. The seventh oldest university in the country was brought into existence by the seventh Nizam of Hyderabad in 1918. This beautifully green campus is so vast that its roads have long come to become regular thoroughfares in the city. So much so that, one does not even know just how many buildings are scattered around here and does not even spare more than a glance. That too when the names on the buildings get you thinking as to all the obscure possible disciplines of formal education and research available! So it wasn’t till I actually stood under the Arts College Building one Sunday morning after I had decided to photograph it, did I realise just how smartly and tastefully this graceful old building has been designed. 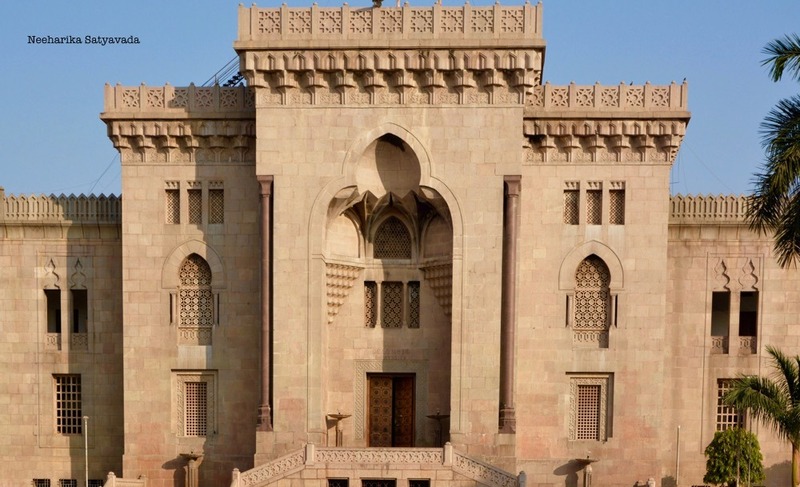 Born from a farman (Royal Charter) by Nawab Osman Ali Khan, this university’s buildings were planned by Mr. Jasper, a Belgian architect, who was “found” by an expert panel of architects and engineers who had toured through Europe, America, Japan, Egypt and Turkey in the quest. It is of little surprise then that the centre piece of this spread, the Arts College is but Poetry in Pink. This Heritage Building of Pink Granite, which took 5 years to construct, was officially inaugurated in 1939. Thank you so much for the suggestion! Love it, will do that asap. Happy to know my pictures bring nostalgia for the whole idea behind this blog is to connect with people through photographs. Beautiful photos ….amazing architecture. Kudos to the Indian rulers of yesteryear for their foresight and passion. Thank you! You are so right about the grandeur of their vision and passion. 😊Sometimes one loses sight of how we have these beautiful heritage structures coming down to us! Yes it is a really peacefully place, even more so early in the mornings. 😊 There were these kids coming to feed the pigeons too! Your pics capture the grandeur of these majestic buildings so beautifully! !